A healthy, chicken dinner that kids will love AND it's ready to eat in under 20 minutes? Sign us up! This easy recipe for baked popcorn chicken requires just a few ingredients, most of which you probably already have in your pantry. 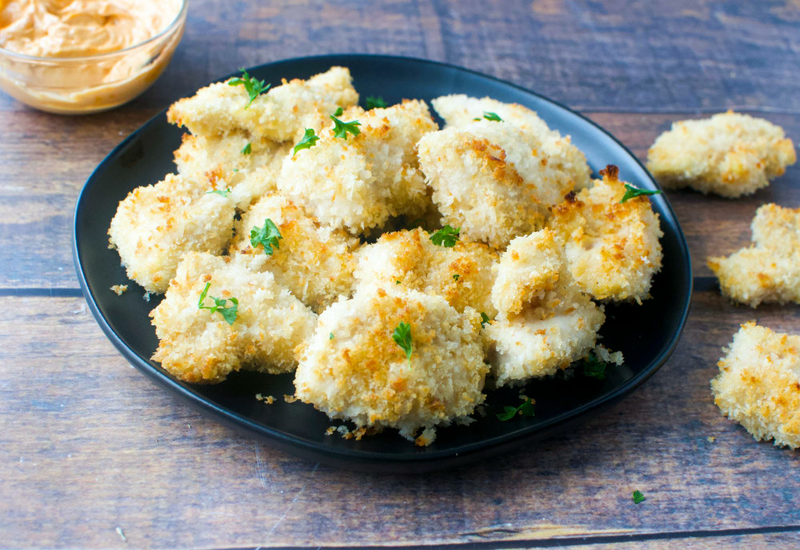 These little bite-size pieces of chicken are crisp from panko breadcrumbs and get great flavor from a mix of spices. Just like popcorn, you won't be able to stop munching on these. Best of all, you can bake them in the oven, which frees you up to make side dishes or maybe just settle down with a glass of wine. Serve this popcorn chicken as is or with your favorite dipping sauce. Or, if you want to go all out, set out a sampler of sauces. A few suggestions: barbecue sauce, honey mustard, and sweet and sour sauce. Per Serving: 617 calories; 22g fat; 39.8g carbohydrates; 60g protein; 145mg cholesterol; 667mg sodium. We made this popcorn chicken for my kids and they loved it. I've got some picky eaters, so this win was huge for us. My kids love this popcorn chicken, including my toddler. Panko breadcrumbs are light and crispy without having to be fried, which makes it a great choice for baking in the oven. This chicken had great flavor too, well done. Good flavor, moist chicken, crunchy texture. I also added seasoned salt, it was really delicious. Kids also loved it. Crunchy and delicious! I love the panko breadcrumbs. I had to leave these in the oven a little longer to get the golden color on the outside, but didn't want to leave it in the oven too long because I didn't want them to dry out. I think 15-17 minutes was perfect. The olive oil dredge worked just ok for me. I think I would have had better luck if I used an egg wash. My favorite part of this recipe, though, was the panko bread crumbs. Extra crispy and crunchy just like I like it.